Easy Installation No tool or drill needed. Easily finish the installation in seconds. No-adhesive design helps to conveniently remove the lock without leaving marks on the furniture.Press two button simultaneously to unlock, which is easy for adults but certainly difficult for babies. Wide Application Suitable for all kinds of mushroom shaped knobs and D-shaped or annular handles, such as cabinets, side-by-side refrigerators, cupboards, storage doors and so on. 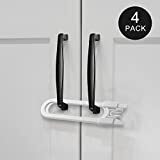 4 Pcs Included 4 pack safety locks for multiple doors use. Reusable and convenient lock exactly meets your need, safely keeping curious babies and active pets away from cabinets. Perfect gifts to keep baby safe while celebrating Christmas holidays. Powerful After-service Each Adoric customer can enjoy ONE year refund and replacement warranty. Risk-free guarantee provides a reliable purchasing experience to you. Please contact us when you meet any problem.